The existing house doesn’t comply with the zoning bylaws. When built in 1910, the setbacks from the property line must have been narrower than they are today, because two corners of the house extend into them, most significantly on the Southern corner. If you want to make any changes to an existing nonconforming property like ours, you need to go before the Zoning Board of Appeals (ZBA). The process takes time, but our architect is hopeful that there won’t be any major issues, because we only need a special permit and not a variance. To get a variance you need to prove you’re suffering from a hardship of some kind, but special permits generally just require that you go through the process without providing any reasons for the construction. 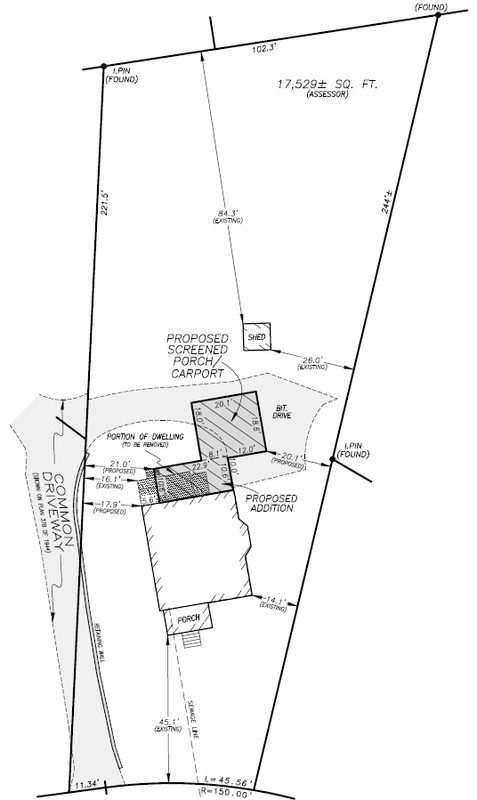 The drawing shows the existing common driveway and its extension into our property. We plan to remove most of it, so the surveyor will modify this draft of the drawing to include the new driveway dimensions once we have a design for them.